Berghoff Beer. Centlivre Beer. ``Lazy-aged'' Old Crown Beer and Ale. Sound familiar? Probably not. But they're names that, for a while, helped make Fort Wayne of the Midwest's leading beer producers. The Centlivre Brewery began in 1862 as the French Brewery which soon adopted the name of its founder, Charles Louis Centlivre. By 1890 Centlivre was a major Midwestern brewery. A fire in 1893 burned much of the original plant, but it was rebuilt even bigger than before. Across town on what is now East Washington Boulevard, the Berghoff Brewery began operations in 1887 and eventually grew even larger than Centlivre. Founders of the company were the Berghoff brothers - Gustav, Henry, Hubert and Herman. As did breweries throughout the nation, Centlivre and Berghoff closed up shop with the onslought of Prohibition in 1919. Centlivre produced a near-beer product called That's It for a short time, but the concoction apparently lost out to bootleggers. Both breweries had changed by the time Prohibition ended in 1933. 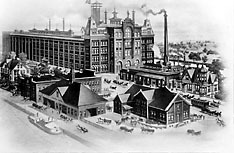 Centlivre resumed by producing Nickel Plate and Old Crown beer, and the Berghoffs sold out their interest and opened up the Hoff-Brau Brewery. In 1950, a new $1.5 million building was added to the Old Crown Brewery, the remains of which still stand. The original buildings were razed about a year ago, and the future for the remaining structure remains uncertain. Part of the original Berghoff plant is still standing, but it's now part of the Falstaff Brewery near Memorial Park which began operations there in 1954. As for Old Crown, the last ``Lazy-Aged'' batch was brewed here in late 1973. The plant had been employee-owned and -operated since 1961. An interesting final note: The likeness of Charles Centlivre, once visible atop the canal-era Centlivre plant, is still clearly visible atop another local landmark - the Hall's Gas House Restaurant on Superior Street.